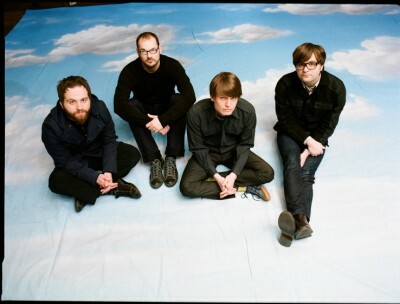 Debuting at number one on the Billboard Top 200 this week, Narrow Stairs, the second major label and sixth studio album by Death Cab For Cutie, took US fans by gale. According to Nielson Soundscan, the Atlantic set moved 144,000 copies in the United States alone; a huge jump from Death Cab for Cutie’s 2005 release Plans, which debuted number four with 90,000 and spent 50 weeks on the chart. On the heels of their 2006 tour surrounding the RIAA platinum, Grammy-nominated album Plans, members of Death Cab For Cutie took a short break to work on various projects outside the band. During this time, DCFC drummer Jason McGerr constructed his own recording studio, Two Sticks. “I wanted more than anything to create a professional studio that was also somewhere that was comfortable to hang out in,” says McGerr on the band’s website, deathcabforcutie.com, about the conception and construction of Two Sticks (which was designed largely with the Narrow Stairs sessions in mind). In addition to the recording time spent at McGerr’s Two Sticks, the band recorded at DCFC guitarist/multi-instrumentalist Chris Walla’s studio Alberta Court and long-time friend John Vanderslice’s studio Tiny Telephone. The dynamic of recording in multiple studios, all of which challenge the quintessential “living room” vibe, was compounded by the recording, which was done in its entirety on a two-inch tape. The benefit being; a limited amount of overdubs and therefore, a sound much like Death Cab For Cuties’s live work. “There’s stuff on this album that makes each of us uncomfortable performance-wise,” explains Walla, adding that the happy accidents – such as tripping over a cable and unplugging Harmer’s bass on “I Will Possess Your Heart” – turned out to be some of his favorite moments on the disc. “We spend an overwhelming amount of time as a band playing live together, so it doesn’t really make sense not to approach our recording the same way,” Gibbard adds on their website. Beginning their tour this Saturday (see below for dates) in Bend, Oregon with special guests the Decemberists and Mates of State, Death Cab For Cutie will also be adorned by Rogue Wave for the U.S. leg of their tour and then joined by Styrofoam in Europe. Keep your eyes out for Tegan and Sara, Sea Wolf, Stars and Young Galaxy along the way.